Scene setting: The Parisian Hotel de Ville (the Mayor’s headquarters) has been home to many a fashion show, but as one editor said today when stepping inside, ‘this place never gets old’. A mammoth of a building in the heart of the city, it never fails to surprise its visitors with its enormous salons filled with paintings, mirrors and crystal chandeliers. You could hardly get any more French... 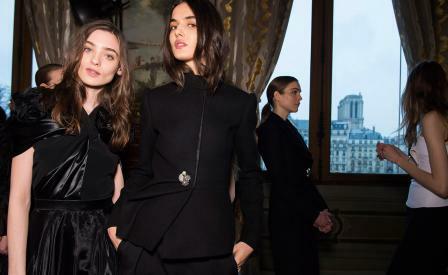 But then again, we are at Bouchra Jarrar’s Lanvin, the Frenchest of the French. Finishing touches: We’re seeing a lot of mini bags this season (bonus points if there is more than one on sight in a single look). Lanvin hopped in on the trend with little ones in pistachio, black and pale pink that the models wore as satchels or clutching on their hands. This show was also the confirmation of something we’ve been suspecting for a few months now: fishnet stockings are back, either worn with dresses or - even better - under trousers.